10/8/08 — Acquisition — Milan, Pinacoteca di Brera — In 1523, Veronica Cavalcabo, the widow of Erasmo Trivulzio, bequeathed 10,000 imperial lires to decorate the chapel of the Immaculate Conception in the church of the Amadeiti Franciscans of Santa Maria della Pace  in Milan. The project was completed twenty years later, as shown by the family’s account books. Her son, Gaspare, a patrician and a decurion in the Milanese government, made payments in 1541 and 1543 to Cristoforo Lombardo for the architecture and to Gaudenzio Ferrari for the paintings. 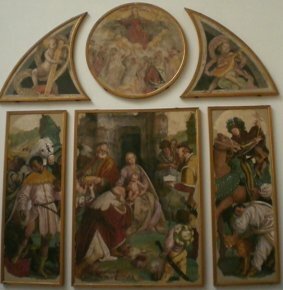 The latter executed a series of frescoes, which were removed after the convent was closed in 1805 and then entered the Brera museum in 1808 (ill. 1). Having passed through private hands, the altar piece (ill. 2 and 3) was successively in the Rasini, Cavalieri (maybe), Cernuschi and then Contini-Bonacossi (1939) collections. 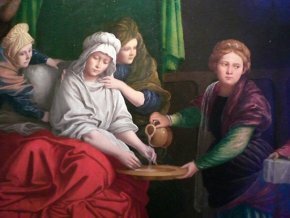 In 2001 it was acquired by the Italian government (Finarte auction, on 17 December 2001, for the equivalent of 95,880 euros) to be placed at the Brera and has just been introduced into the galleries after several years of restoration- , thus joining the other works devoted to the circle of Mary two hundred years later. 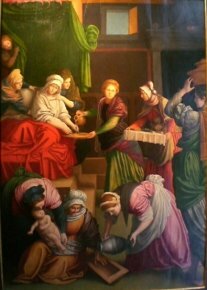 This painting, which dates back to Gaudenzio’s last artistic period, was executed with the help of assistants and still presents the organized spaces and brilliant colours of the late Quattrocento, but also introduces motifs taken from engravings after Raphael (the woman holding the basket atop her head on the right), as well as those by Durer, and reveals the discovery of the latest Mannerism from Emilia, notably in the gracefulness of the elongated figures. 1. Slightly out of the way and the victim of several closings, this church is not on most popular tourist circuits for Milan. See the article in Italian on Wikipedia. To see the presentation of the study on several restorations, go to this link.